This and all covers and logos ©Edgar Rice Burroughs, Inc. or their respective copyright owners. Even before the popular series of Tarzan novels, the character first appeared in pulp magazines, beginning with this one from 1913. 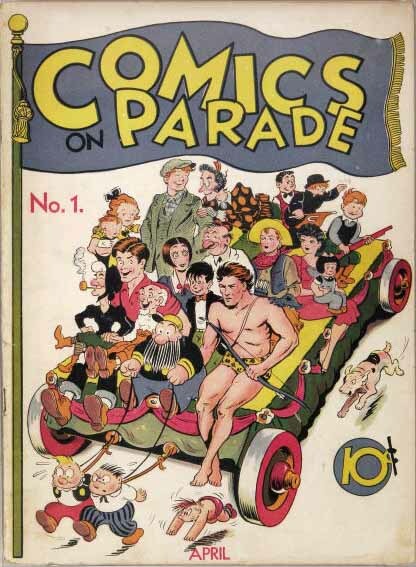 And there are elements of pulp covers that will lead us to the newspaper strip and the comics. Most pulps had hand-drawn logos and story titles, especially in the early years. It was a glorious era for hand-letterers I’m sure, though I have no idea of how well they were paid for their work. 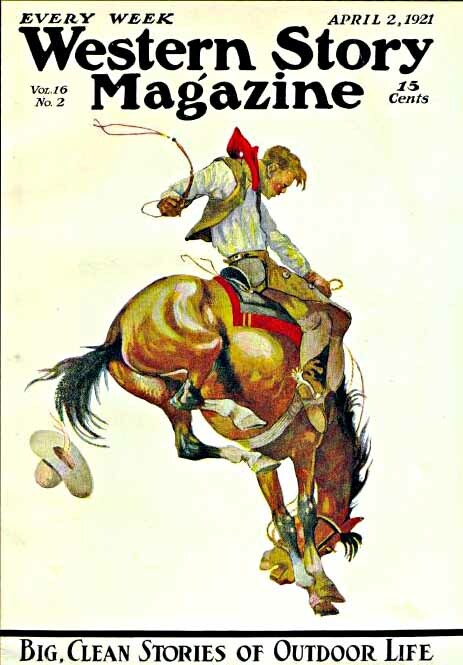 In many cases, cover artists did some or all of the lettering work themselves, in others it was probably handled by staffers at the pulp publishers. The title lettering for Tarzan’s first appearance above is a fine example of a well-designed and attractive hand-lettered piece. It looks to me like it was done separately from the art and combined with it photographically, along with the logo, though it’s hard to be sure. 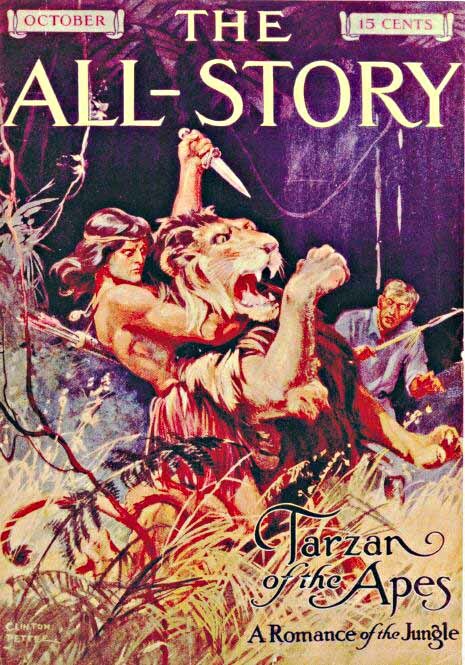 In any case, the style is not too far from some of the Tarzan book titles we looked at in part 1. Rounded serif fonts with long, curled swashes. Upper and lower case, as with the title of the first Tarzan novel. Not very evocative of the savage character of the Tarzan or the action-filled scene depicted, but still very appealing. Here’s another pulp cover with an attractive upper and lower case serif style title. Again, notice how all the words on this cover are hand-lettered. If you look closely you’ll see minor variations and differences between the two A’s in Magazine, for instance. More than that, you can just tell by the overall look that it’s hand-lettered by the looseness and originality of the shapes that one just doesn’t get from type. Sunday strips required a logo that would be copied and pasted onto the art every week, and Tarzan acquired an excellent one that continued on the Sunday strips for decades. Here’s a better look at it on a Hal Foster Sunday page. Foster was brought back to do the Sunday strips, as Maxon’s drawing skills were not really up to the task. The letter forms have similarities to both the title on ALL-STORY and the WESTERN STORY logo. Notice the ball-shaped arm of the R, the slanted right leg of the N, the thick-and-thin strokes. There are important differences, though: the strip logo is open for color, a featured element of Sunday strips, and it has a surrounding outer outline to hold it apart visually from the background color. That outline is very thin, and is dropping out on this example, though it probably looked fine on the original page. The letters AR and AN are joined in a logical and attractive way, reminiscent of what J. Allen St. John did on some of his book covers. There’s no telling at this point who created the logo, which over time has continued to be used on many Tarzan products, but my guess is it was done by someone with experience in pulp magazine lettering, possibly someone who was familiar with Tarzan’s pulp appearances. The character was wildly popular, so that’s not a stretch. 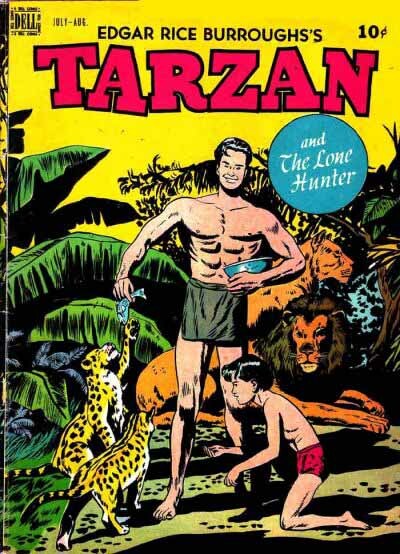 So, while St. John continued to do something new nearly every time on the book covers, for the strip they stayed with this fine logo every week, helping to establish the Tarzan brand and name. 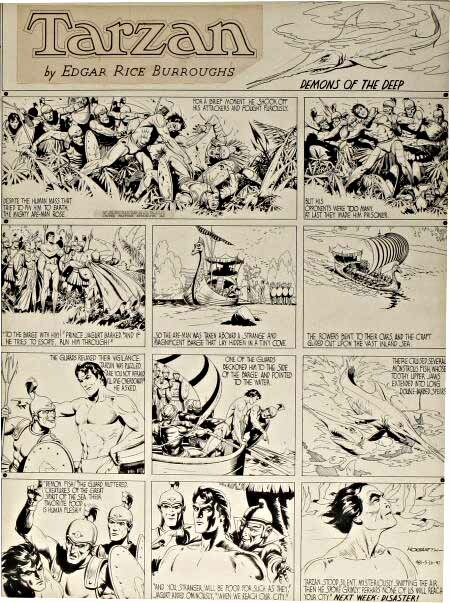 Tarzan made it into the newly emerging comics field early, as in this 1938 issue, but in the form of newspaper strip reprints at first, in anthology titles like this one where he usually didn’t get a solo cover spot or logo. It wasn’t until 1948 that a title of his own was launched with new material. 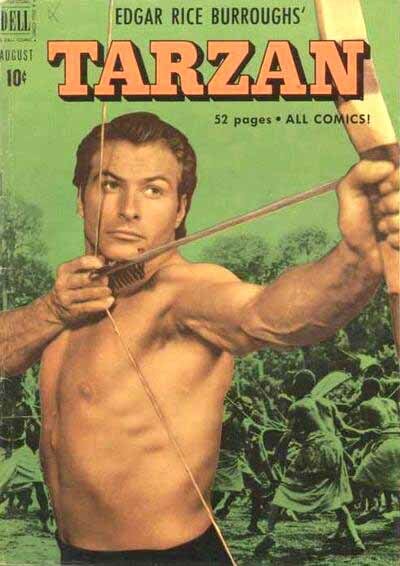 Tarzan issue 1, published by Dell Comics, featured art by Jesse Marsh, who I think also did the logo and title for this and subsequent issues. Once again this was a licensed property, so Dell probably didn’t have permission to use the newspaper strip logo, but you’d think they’d try to get something that at least had the same flavor, or perhaps get ideas from the book covers. Instead, Marsh did this very cartoony serif style that seems totally inappropriate for Tarzan to me. My guess is it sold just fine to kids, though, who probably didn’t care about such things. The same logo was on issue 2. For issue 3 Marsh (I assume) did this one. Bolder and more effective, but still not very well designed, and with a cartoony roundness, especially on the inner red shapes that I don’t find very appealing. Plus it looks crammed into this cover. It was a small step in the right direction, though. Issue 4 had this much improved look with a bold slab-serif font perhaps more appropriate for a western, but much better than previous logos. The letters still have bounce, but the square corners help make it more appropriate for Tarzan to my mind. Kind of odd that there are those tiny gaps inside the A and R, I would have just filled those in, but it works pretty well overall. For issue 22, in 1951, they went with the same letter forms, but drawn much more evenly, and now with a small telescoped drop shadow. Notice how all the words other than the logo are set in type. Think they were trying to present a more mature image to promote this movie-tie-in photo cover? Seems likely. It’s not a bad look, but making the letters more even and square seems to emphasize the western poster look to me, and I actually preferred the previous version. From issue 23 on they reduced the T to the same size as the rest of the logo, and often floated it over the art, as here. Really, not a terrible look, but compared to the newspaper strip logo, this one is pretty bland and boring, don’t you think? 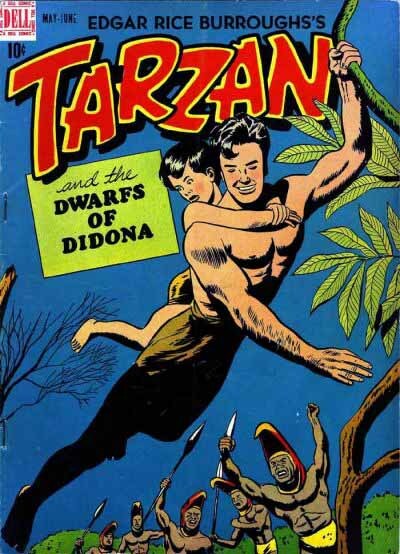 Despite that, Dell stuck with it for most of the 1950s, usually with photo covers from a long series of popular Tarzan films. 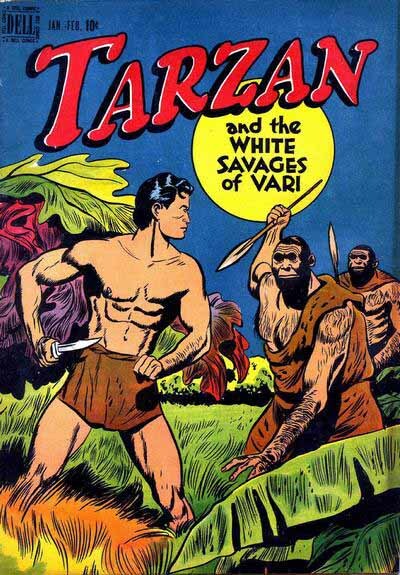 Next time we’ll follow Tarzan comics to other companies, and check in with what the Tarzan books were doing at the same time. This entry was posted in Logo Studies and tagged Hal Foster, Jesse Marsh on December 7, 2007 by Todd. You know, Todd, I have a file with most of these in it, PLUS I have collected these Tarzan products for YEARS just for the Logos. Never thought I’d get to read about it in a Blog pertaining to lettering and design. So if you wondered who you prepare stuff like this for, you just made my day! Glad you’re enjoying it, Jon, thanks for the comments!